Kathleen (Katrina) Sheffield studied at Southend Art School and later at the Katinka School of Dressmaking in London. 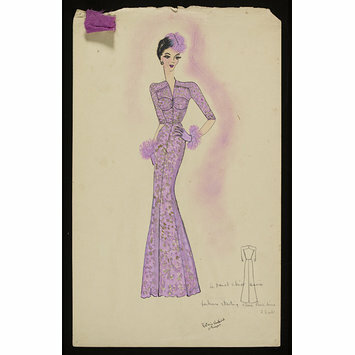 It was during her studies at the Katinka School in the late 1930s and early 1940s that she made this design as well as a number of others now in the V&A’s collection (E.555-2015-E.614-2015). She subsequently worked for a short time as a fashion designer at Lachasse Fashion House in London which was headed by Hardy Amies and Digby Morton. According to Sheffield’s recollections, Amies and Morton were happy to let her design but some of the cutting-room staff regarded her as an upstart and often changed her designs. In 1941 she was called up to serve in the Auxiliary Territorial Service. After the war ended she did not return to fashion, as her husband’s job in the Diplomatic Service meant they had to travel around the world. While in Rio de Janeiro in the 1960s she met Phyllis Ross, a Canadian artist and wife of a Counsellor in the Canadian Embassy, who ran art classes. This encouraged her to begin painting again. Once she and her husband returned from postings abroad, they lived in London and subsequently Cambridge where she continued to paint and exhibited regularly. She took part in the Open Studio Scheme in Cambridge until she was well into her eighties. A drawing of a woman in a long-sleeved purple gown with grey detailing, purple gloves, and a purple feather fascinator. In the top left corner there is a swatch of purple material. 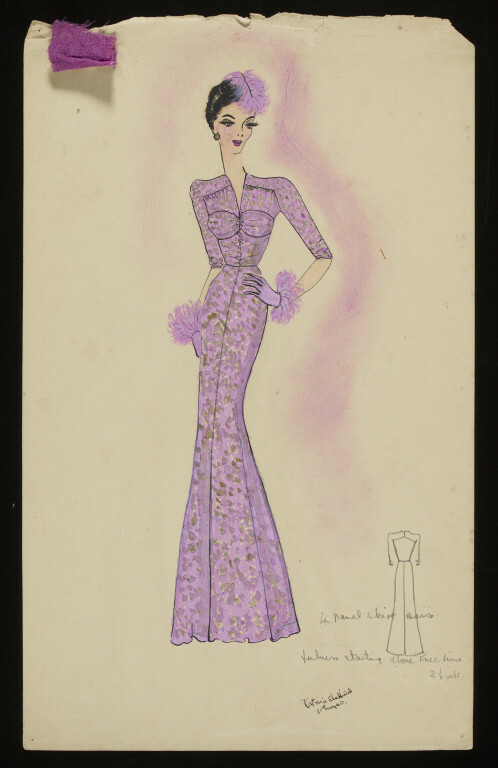 In the bottom right corner there is a pencil drawing of the gown shown from the back.